Kevin Braniff has made the switch from Glenavon to Ballymena United. 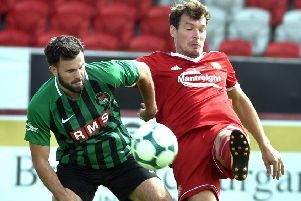 The former Northern Ireland international got the green light after a medical today and has finalised terms on an 18-month deal. “We’re delighted to agree a deal with Glenavon to bring Kevin Braniff to the Showgrounds,” Ballymena manager David Jeffrey told the club website. “This is after much hard work by the staff here, in particular Bryan McLoughlin and Paul McAreavey. “Kevin brings experience and quality to the squad, but most importantly he has bought into the ethos here and where we are trying to take the club. “We said at the start that we are going to build a squad here of players that will be perfect jigsaw pieces in the bigger puzzle, and we also do that on a strict wage structure that everyone, including Kevin, have to fit in to. Braniff told the Ballymena United website of his excitement at a future under Jeffrey. “I’ve nearly signed for David on a few occasions and now I am excited and looking forward to finally get the chance to work under him,” said Braniff, “I’ve heard about how he works and what he is doing at Ballymena United and glowing reports of him and his management style.